Albuquerque Isotopes outfielder Mike Tauchman has been named the Pacific Coast League Player of the Week for the period of May 14-20, the league office announced today. Tauchman batted .417 (10-for-24) in six games last week while leading the league with eight runs scored, 27 total bases, five home runs and a 1.125 slugging percentage. The 27-year-old's six extra-base hits and eight RBI were also tied for the most in the PCL. Tauchman's week was highlighted by two multi-homer games coming on Tuesday at Las Vegas and on Saturday vs. Reno. The outfielder was also a double away from hitting for the cycle Thursday against the Aces, going 4-for-5 with two singles, a triple and a home run. The Palatine, IL native is in his sixth professional season after being drafted by the Rockies in the 10th round of the 2013 First-Year Player Draft. Tauchman is hitting .392 (40-for-102) with eight home runs in 26 games since rejoining the Isotopes from Colorado on April 22. The Player of the Week award is the second he has won in professional career, having also received the honor with Short-Season Tri-City of the Northwest League in August 2013. 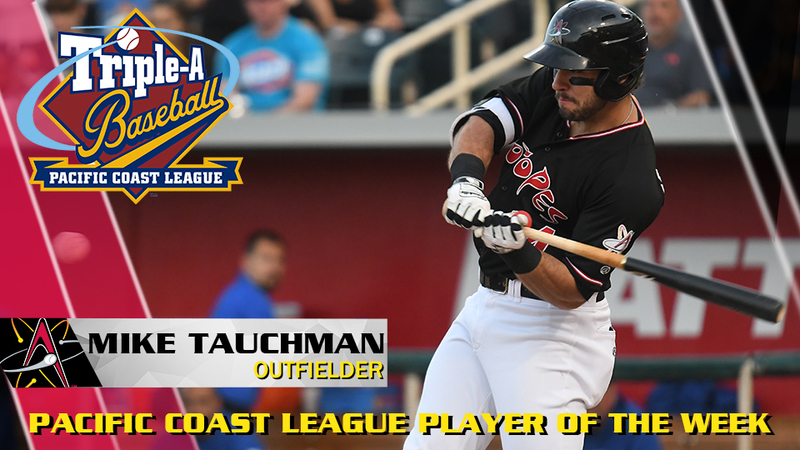 Tauchman is the first Isotope to be named a PCL Player of the Week this season. The Isotopes continue their eight-game homestand tonight, beginning a four-game set against the Salt Lake Bees (Triple-A Angels). Tickets are available at abqisotopes.com and at the Isotopes Park Box Office.